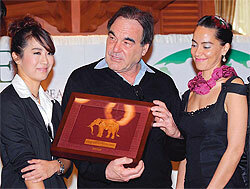 US film director Oliver Stone, in Bangkok to deliver a pair of keynote speeches about world peace, says we are all living in "a dark time - darker than anything I've ever known in my 60-plus years". It is our collective responsibility to "restore decency to this terrifying world", he told the Foreign Correspondents' Club of Thailand last night as part of the Dialogues Towards a Culture of Peace programme, organised by the International Peace Foundation. In his 25-minute speech, "Film-making and Peace-Building", Stone recalled pivotal moments in history, from the hysteria against Communism when he was young, to Wall Street's stock madness in the 1980s. He discussed the two Iraq wars, the "lynch mob" mentality after the Sept 11, 2001, terrorist attacks and how "an immature president [turned that event] into political advantage". Stone emphasised the need to be realistic and "to think about the positive and not give in too easily to the negative." Stone has directed over 20 films since he launched his career in 1971. His work often delivers a strong, sometimes controversial political message, such as the movies Nixon, JFK, Born on the Fourth of July, Commandante (in which he interviewed Fidel Castro), W (about the life of George WBush), and South of the Border (a documentary about Venezuelan President Hugo Chavez). His historical epic Alexander was partly shot in Thailand. "I won't give up believing that movies can help express the best in us, to light candles in this darkness," he said. He added that a blockbuster film like James Cameron's Avatar could help create a better world. "I hope that [Avatar] is crawling into the unconscious of the world," he said. Popular films with a strong message can work subversively as "guerrillas of the mind". Movies can show us "how things can be", Stone said. Yesterday the director gave a speech at the New International School of Thailand and then met up with Thai stars Mario Maurer, Marsha Wattanapanich and Sukrit "Bie" Wisetkaew. Stone's next film, slated for release later this year, is Wall Street 2: Money Never Sleeps. It stars Shia LaBeouf and Michael Douglas.